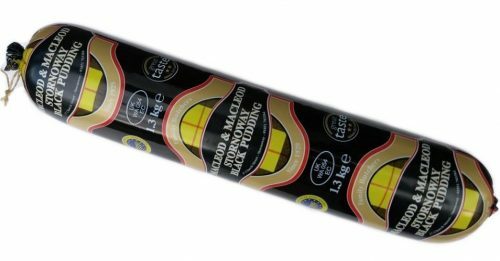 We supply by mail order The Original Stornoway Black Pudding produced by MacLeod and MacLeod butchers in Stornoway, Isle of Lewis. Along with the Stornoway Black Pudding we have a great selection of fine traditional Scottish Food, many produced in the Western Isles of Scotland. Please visit our shop below. Orders placed before 1pm are usually dispatched same day for next day delivery to UK addresses. We do not dispatch on a Friday, orders placed after 1pm on Thursdays will be dispatched on the following Monday. We are happy to take orders by telephone if you prefer. PLEASE NOTE: Deliveries can now be made to Belgium, France, Germany, The Netherlands and Republic of Ireland. Delivery is within 2 to 3 days to most destinations.